Tonight saw the UK première of the latest work by Rebecca Saunders, her violin concerto still. Saunders’ music has been a growing musical passion of mine for a while; as such, i’ve already begun a longer article surveying her work, but i’ll leave that for another day, and for now focus on the concerto. It was composed for soloist Carolin Widmann, and the performance, which took place at the Barbican, was given by her with the BBC Symphony Orchestra, directed by Lionel Bringuier. These same forces (directed by Sylvain Cambreling) gave the première of the work last September at the Beethovenfest in Bonn. The piece is in two movements, together lasting around 20 minutes. In the preamble, Widmann interestingly notes how the piece bore the provisional title rage, a title that seems in keeping for a composer who’s twice written pieces called fury. However, both of those pieces (for double bass solo and double bass plus ensemble respectively) avoid hackneyed tropes of aggression, their protagonists engaged instead in a music that is surprisingly restrained, but pent-up and seething. The first movement of the concerto occupies territory that’s not dissimilar to this, the soloist establishing itself via a sequence of thin, wavering, spasmodic overtures. It’s built upon a gesture that seems to be seeking direction, which, once found, enables the violin to hint at a melodic sense, enlivening the orchestra (the brass become particularly demonstrative). Saunders allows things to build to a harsh tutti of sorts, but one that sounds less like a homogenous block than a dense agglomeration of individual strands. As with a lot of her music, there’s a portentousness to this kind of juxtaposition of sounds, but it’s not until everything then halts and softens that one detects more clear traces of rage, the soloist occupied with ferocious amounts of filigree. Despite such manic material, the violin’s line is broken by dry thuds, and the music stops again, this time revealing a static shimmering chord. The violin seems compelled to force itself on despite these interruptions (which remain ambiguous as to whether they’re in opposition or sympathy with the soloist), withstanding an ever increasing clatter from loud metallic percussion, until it comes to another abrupt stop, now exposing a very deep grinding bass drone (a regular feature in Saunders’ music), heard earlier in the movement. 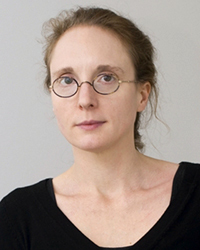 The quietness of Saunders’ music – or, rather, the unique way silence is for her a distinct, fundamental compositional element – has become something of a cliché in discussion of her work. Yet even in this quiet second movement, the nature of its palette as well as the way it unfolds sets it apart from many if not most of Saunders’ earlier works. That said, the movement does inhabit a familiarly ascetic sonic space, emerging out of nebulous rumblings. Without – as far as i can tell – recourse to an actual mute, Saunders successfully muffles both soloist and orchestra throughout the movement, in addition to loosening its structural integrity; despite the lack of clear-cut silences, the result is a kind of ‘open weave’ that bears some resemblance to her previous work, but in which silence plays a less overt role. The substance of the music is heard in little more than glimpses; snatches of rich aspiration from the violin (usually in a very high register) are met by a slow fizzling in the instruments around, leaving more deep traces of bass. As a momentary outcry from the orchestra subsides, the soloist busies itself but for a while is no longer heard in relief, until it returns to the foreground with a series of glissandi, some soft but frantic final flurries, and a long sustained note that appears to slide into the heavens only to falter slightly at its zenith.